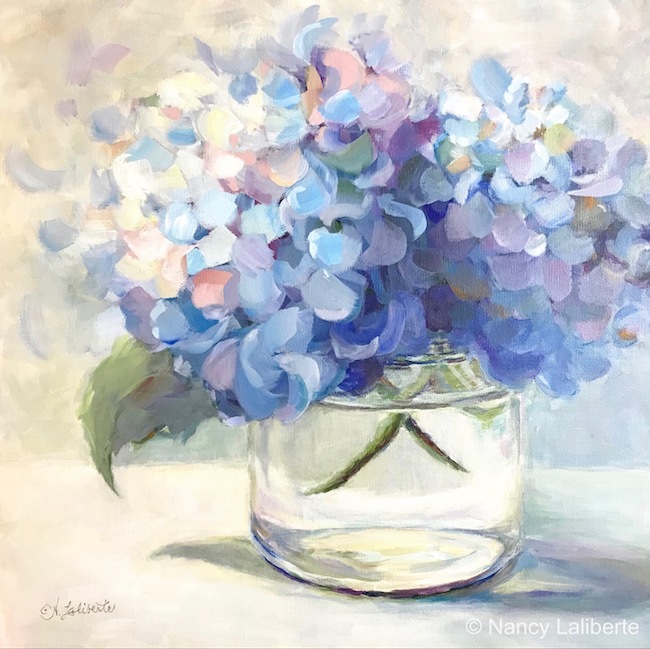 Continuing to work with the water-soluable oil paints, my good friend and fellow artist, Val Berkely and I, decided to follow an exercise from the book, Painting with Water-Soluable Oils by Sean Dye. Kevin Macpherson is a featured artist in the book so we followed his painting exercise to help us get a feel for working loosely and with lots of paint. In the end, our pieces didn't look like Kevin's but we had fun trying! My painting ended up looking better upside down, and somewhere hidden under the layers is a vase that is, well, upside down. 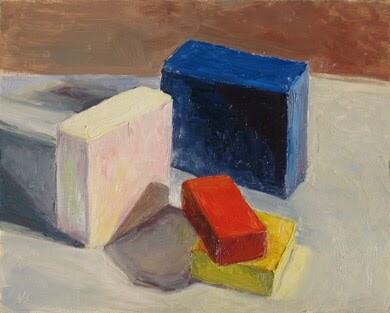 A block study exercise adapted from Susan Sarback's book, Capturing Radiant Color in Oils. 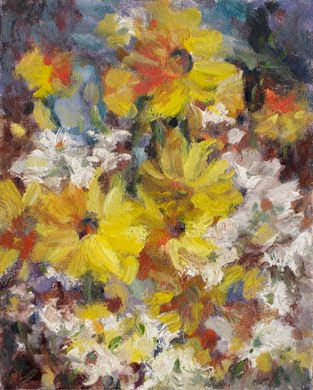 Susan studied with Henry Hensche at the Cape Cod School of Art. One of the artists featured in the book is John Ebersberger, whom I had the opportunity to study with in 2004. That was my first introduction to seeing color and palette knife painting. To this day I still remember, "light plane, shadow plane." Block studies are a great exercise in seeing color and breaking down the masses with more color--something I think I could have pushed more in the painting. This piece was done primarily with a palette knife with a bit of brushwork at the end. 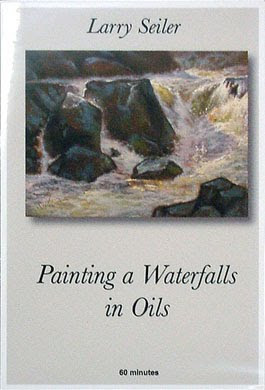 A good charrette always includes some art videos and our favorite was Larry Seiler's Painting a Waterfalls in Oils. Larry is a high school art instructor and all I can say is he has some lucky kids. His video was very complete and he does a great job explaining palette colors, design, brushwork and more. Check out his blog and website for more painting tips and other good stuff. Why do you have me standing upside down looking for a vase? You just had to add that comment, didn't you!